You want the perfect wedding dress, so you have made it a major focus of your pre wedding planning. There are some things you need to find from the bridal shop, before you even look at your first gown. Do you need to make an appointment to visit the shop? Does the store carry dresses you can afford Can you browse the whole collection, or do you only get to see the dresses the sales person chooses for you? If this shop doesn’t carry the dress you love, can it be ordered? Once these questions have been answered and you find a dress or two that you like, there are still more questions you need to ask. Can a particular dress be ordered with different sleeves, or neckline? What alterations can be done and what will that cost? Can you get a written estimate on the alterations? If we order the bridesmaids dresses here, can we get a discount or free alterations? Do you have headpieces and or veils that will go with my dress? Can we get a Rush on this dress if necessary? These are the most important questions to ask, but you will probably have some of your own. Beware of any shop that won’t give you straight answers or written estimates. When you think you have found just the right dress, ask if they can hold it for a day or two, then go home wait at least 34 hours and go back for another look. If you still love it, then go right ahead and buy it. On the other hand, if your mother, maid of honor, sales clerk or friend thinks a dress is perfect and you are not sure, use the same strategy. Wait a day; go back for a second look before you reject it. If a dress just doesn’t feel right or you just don’t like it do not yield to pressure from the store staff, friends or even Mom. It is your dress, your day, you decide. After you have chosen your wedding dress, the clerk or the shop’s seamstress will take measurements of your bust, waist and hips, and determine if the dress needs to be taken up. Just about every wedding dress needs some alterations. You will also need to go in for fittings, usually at least three times. Make sure, if your alterations are not free, that you get a written estimate. Find out if you will be able to “borrow” your dress for a portrait sitting, and return it for pressing afterwards. Pay with a credit card so that if anything goes wrong, you can dispute the payment. You have another big decision to make. What about your headpiece and veil? The sales staff should be able to assist you in choosing a headpiece that goes with your dress. Veils come in several lengths and styles, and again the staff can help you decide which is best for you. The veil you choose for your wedding depends on the dress you have chosen. If you are wearing a street length casual style dress you wouldn’t choose a cathedral or chapel veil, both of which trail the floor. By the same token you wouldn’t wear a flyaway veil, which barely brushes the shoulders, with a formal dress with a train. Don’t forget you need to get the right lingerie, shoes and jewelry, to go with your beautiful wedding dress. Before we leave the bridal salon, there is one more detail to attend to, your bridesmaids dresses. When choosing these dresses, you need to take into consideration the ages, complexions, and body types of your attendants. Fortunately today’s bridesmaid’s gowns are no longer the cookie cutter dresses all in the same color, that nobody would ever wear again. Some options for bridesmaid’s dresses are to choose a color and fabric suitable for all of the women and let each of them pick a style that she is comfortable with. Or you can choose a simple a-line or empire waist dress that flatters all figures, and let the girls choose the from a color family, say purple, the options could be lilac, lavender, plum, mauve and orchid. If you do choose to have all attendants wear the same dress, they can personalize the look with small beaded purses, scarves, jewelry or shawls. Also, be aware that the colors and your bridesmaid’s wear have to complement the color scheme of your reception, you don’t want a red plan for your reception in red if your maids are wearing green, unless you are going for a Christmas look. The wedding is over, now you have to decide what to do with that beautiful, expensive dress. You can put it on a hangar in the back of your closet, where any stains will set and be very difficult to remove at a later time. You need to ask your bridal shop or wedding consultant in advance for the name of a gown preservationist. 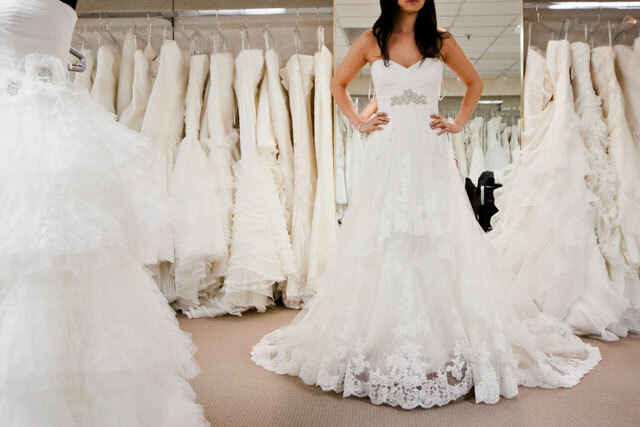 Many dry cleaners claim to clean wedding gowns, but most are not experts in preservation. There are two cleaning methods used by preservationists. Some use the wet cleaning method, this entails washing the dress by hand with a mild cleanser, that removes visible and invisible stains (champagne and sugar) Other companies use the dry cleaning method, where stains are pre-treated and then put in a dry cleaning machine. Once the dress is cleaned, it is wrapped in white acid free tissue paper or unbleached muslin. Ordinary tissue paper has acids that can stain and eventually eat holes in your dress. Then the wrapped dress is in is placed in an acid free or paperboard box. Sometimes the box has a viewing window of acetate. Store the box in out of direct light to keep the dress from becoming yellow. Having your gown cleaned and packaged by a reputable preservationist can cost between $200- $400 depending on where you live. Before sending your dress off to be done, ask if the work is done on site. Also find out if you have to sign a disclaimer and sometimes say that the company is not responsible for damage done during the preservation processes, You should seek out a preservationist who will guarantee her or his work. To help preserve your dress never wrap it in plastic, don’t hang it on an ordinary wood or wire hangar, because the dress could stretch and distort from its own weight. Don’t try to clean stains, this could cause them to set. If you are all tapped out after the wedding you can do things to prolong the life of the dress. Wrap the dress in unbleached muslin, or a white sheet, and store in a sturdy box under your bed. Then as soon as you possibly can take the gown to a professional preservationist. Some day your daughter may want to wear it on her wedding day. Martin Smith is a successful freelance writer providing advice for consumers on purchasing a variety of Wedding Dresses which includes Informal Wedding Dress, Discount Bridal Gowns, and more!